The Cedar Waxwing has a black mask, a short crest, and unusually silky cinnamon-brown plumage. The "waxy" red tips on the secondary flight feathers of some adult birds is not always easy to see, and their function is unknown. Unlike most North American birds, the Cedar Waxwing is primarily a fruit eater and many aspects of its lifehistory, from its nomadic habits to its late-season nesting, reflects this diet preference. Cedar Waxwings are very social birds and are known to sit side by side and pass a berry or insect from one to the other until one bird eats it. The breeding range extends across Canada and the northern United States south to northern Georgia, and Cedar Waxwings winter throughout the United States into Mexico and Central America. Description: These sleek birds have a distinctive crest, a black mask and chin patch, a soft cinnamon-colored plumage, grayish pointed wings, and a grayish tail with a yellow terminal band. Not all birds have red waxy tips on the secondaries. The sexes are nearly alike, but the chin patch on the male is more extensive and darker than on the female; juveniles (July-January) are mottled gray-brown. Voice: The call is a very high, thin whistle. Waxwings call frequently, especially in flight. No other bird found in Tennessee has a yellow terminal band on the tail. Also, the combination of soft cinnamon-colored plumage, head crest, and black mask make it an easy bird to identify. 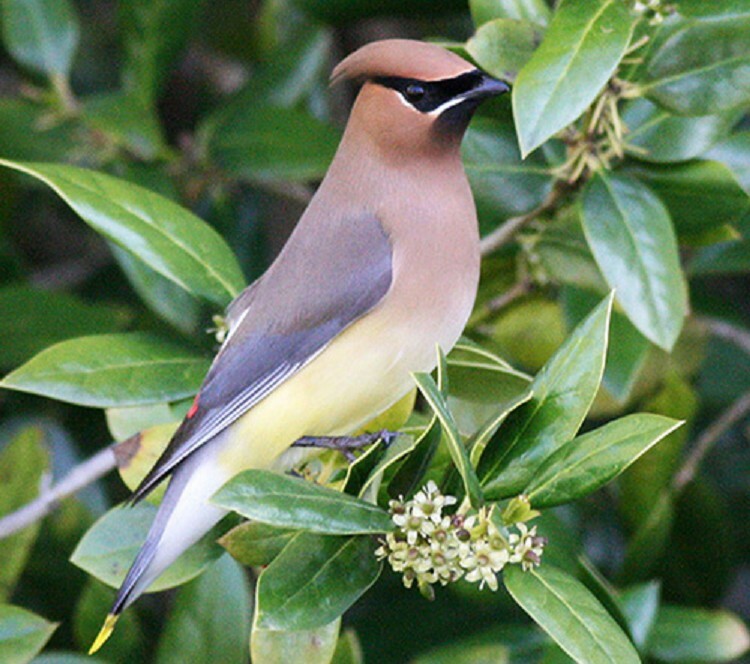 Habitat: Cedar Waxwings breed in woodland edges, old fields with shrubs and small trees, riparian areas, farms, and suburban gardens. They winter in areas with fruit-bearing trees and shrubs, especially open woodlands, parks, gardens, and forest edges. Nesting and reproduction: Cedar Waxwings are among the latest nesting birds in North America, and this enables them to capitalize on the abundance of fruit in late summer and early fall. In Tennessee nest construction peaks in early June and nesting extends into August. Waxwings defend only a small territory and sometimes form small nesting colonies. Incubation: The female incubates the eggs for about 12 days with the male bringing her food. Fledging: Both parents feed the young insects for the first few days and then mostly fruit. The nestlings fledge at about 15 days old, but stay close to the nest and are fed by the parents for another 6 to 10 days. They may then join a flock with other juvenile birds. Nest: Both members of the pair help build the nest, which is usually on a horizontal branch or fork of a deciduous or coniferous tree. The nest is a loose, open cup made of grass and twigs, lined with moss, rootlets, fine grass, bark, and hair. The average height in Tennessee is 26 feet. Status in Tennessee: Cedar Waxwings are fairly common breeders in East Tennessee and uncommon breeders in the western part of the state. They are uncommon winter residents and fairly common migrants across the state. Cedar Waxwing numbers have increased significantly in Tennessee since 1966; the rate of increase is one of the highest of any native bird. Some scientists think that the waxy red tips found on the secondary wing feathers of some individuals may serve a role in mate selection. The number and size of the wax tips increase as the bird ages. Brown-headed Cowbirds that are raised in Cedar Waxwing nests typically don't survive, in part because the cowbird chicks are not able to grow on the high-fruit diet that the parents feed their nestlings. Cedar Waxwings may become intoxicated after eating fruit that has fermented. Flocks of impaired individuals have been known to simultaneously hit large glass windows when scared by a predator or a human, resulting in mass casualties and fatalities. Best places to see in Tennessee: Cedar Waxwings are most commonly found as breeders in the Cumberland Mountains and in the mountains of East Tennessee. Flocks of up to a few hundred birds are patchily distributed across the state in winter where fruits are available. Witmer, M. C., D. J. Mountjoy and L. Elliot. 1997. Cedar Waxwing (Bombycilla cedrorum), The Birds of North America, No. 309 (A. Poole and F. Gill, eds.). The Academy of Natural Sciences, Philadelphia, PA, and The American Ornithologists' Union, Washington, D.C.